A service area at the bottom of the M40, filling a large gap between the existing services. For a while it was the highest-rated motorway service area on this site, with an impressive four-and-a-half stars after a record-breaking number of votes (see below-right for the latest figures). First three hours free for all vehicles, after which you must pay £35 per 24 hour period. Parking tickets can be bought from machines in the car park and can be paid in either GBP or Euros. When it opened, Beaconsfield was treated by many as the only late-night meeting point in the area, which began to cause issues. It now has a dedicated police community support officer on site for crime prevention. Extra contribute half of the cost of the officer, backed up by security guards in the evenings. The service area describes itself as "one of the most attractive service areas in Europe". Beaconsfield was granted planning permission in 2005, to much controversy amongst local residents and the local media. It replaces a long-cancelled plan for a service area at Abbey Barns. The plans claimed it would be the UK's biggest service area, with the UK's biggest petrol station. Cobham has since beaten it. One of the biggest concerns was that traffic exiting the services would need to cross the busy A355, and the last thing M40 users would want is a spitting image of the traffic disruption at Cherwell Valley. 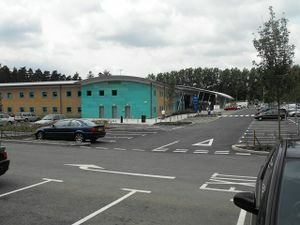 The services were built in a large area of woodland and were originally forecast to open in September 2008, but instead opened on the morning of 17 March 2009. An official opening event was held on the 28 May 2009. There are 675 car parking spaces, 60 HGVs, 12 caravan spaces and 15 for coaches. There were suggestions that the services could feature a park-and-ride site to appease local residents, but this turned out to be false. Around the back of the building there is a lake and a terrace. The upper floor is used by Extra as a head office, which they moved to from an address in Lincoln. The Starbucks at Beaconsfield was previously operated directly by Starbucks but it has now been transferred to Welcome Break. They also opened a PizzaExpress here in December 2018. Moto operate Greggs and the M&S Simply Food store here. They opened a West Cornwall Pasty Co kiosk with a Krispy Kreme cabinet in summer 2017. 'The Hope & Champion' Wetherspoon pub gained planning permission in June 2013 and opened on 21 January 2014. It is still the only pub at a service area, and at first it was a controversial idea due to drink-driving laws. A Nando's restaurant opened here on 13 August 2014. Shell introduced a short-lived Pizza Hut Express offering at the filling station in early 2017, alongside a new Costa Express machine and a new Deli2go hot food station. 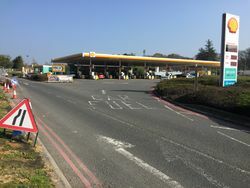 In March 2018, Shell introduced the UK's first integrated petrol-diesel-hydrogen filling station pumps under the same canopy here. In late 2018, Shell introduced their latest offering deli by Shell here. During April 2018, the Mint Leaves unit here was removed and was replaced by WrapChic in June 2018. In February 2019, it was announced that Extra's first Starbucks Drive Thru would be opening soon.